When is the right time to spend a night out at a restaurant? For us, we believe the answer is “all the time!”, but we understand that not everyone can do that. For this reason, we’ve compiled a list of some of our favorite occasions people choose to come eat with us at FIREBREW Bar & Grill! Read on and visit us for all your top holidays! Nothing celebrates getting one year older better than a delicious meal cooked in an open deck oven. That’s why so many families choose our bar and grill for their big day. Feel free to bring in your presents for the birthday guy or gal! Plus, our menu is so diverse that we have something to meet everyone’s needs. From salads to appetizers, seafood to steaks, pasta dishes to burgers, we have it all! Before you hit the town and celebrate your final fling before the ring, load up on a hearty and savory meal with us. Don’t worry, we won’t stop you from getting the party started right from the beginning with our delicious beer options and our self-service wine station. That’s right – you can select your wine type, the size glass you’d like, and how many glasses you want before you all really get the party rolling! Contact us today to let us know how many we can expect for dinner! Your parents are the best, and we know it, too. That’s why we can’t wait to treat such wonderful family members to an incredible meal they won’t soon forget. It will be great to bring the family together for an enjoyable meal that your parents won’t need to cook. And, with all our options, you can be sure that everyone will find something they like. No need to ask yourselves, “What do you think Dad will want to eat for dinner on Father’s Day?” this year. Instead, take him somewhere that serves all his favorite dishes and then some. The same goes for Mom! Did you just get a promotion at work? 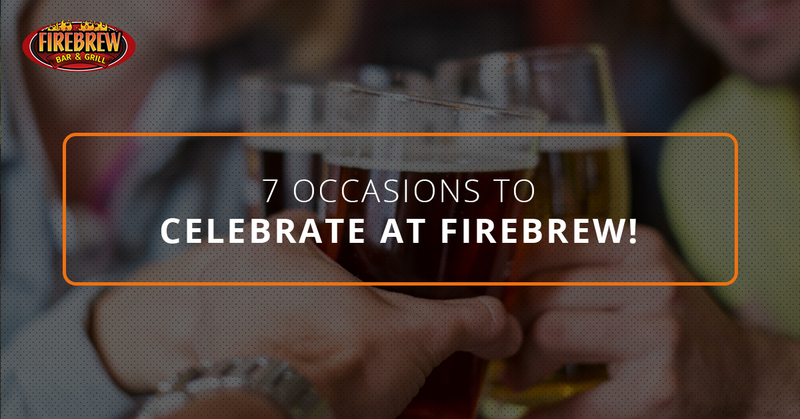 FIREBREW Bar & Grill is the perfect place to celebrate. We have appetizers that are ideal for sharing with your coworkers, friends, family, or all of the above! Swing by right after work for our happy hour specials or plan a nice dinner to memorialize the occasion. Whatever works best for you and your crew works with us! You should be proud of your accomplishment and get a fresh steak dinner to treat yourself. Date night will never be the same after spending a night treating your sweetie to all the incredible foods that FIREBREW Bar & Grill has to offer. Whether you two want to indulge in one of our steak options and choose your wine from our self-service wine station, or if you want something a little more laid back, such as one of our burgers, we have you covered. Of course, Valentine’s is the perfect day to come out with your significant other, but you can always choose us for a low-key date night, as well. Did your team just win their game? Whether your team is your daughter’s softball team or your NFL team of choice, it’s time to celebrate the victory. Take your friends and family out and brag about the win! Order a pizza for the whole crew to split, and everyone of age can indulge in one of our local beers or a glass of wine. Do we always need a reason to treat ourselves to an incredible meal? We at FIREBREW Bar & Grill say “no way!” Sometimes you could just use a night off from cooking for the whole family, but you don’t want to choose fast food. When this is the case, come see us. With all of our food cooked in our 600+ degree open flame fire deck oven, you can expect an incredible meal each and every time. We also boast our open kitchen concept, meaning that you can see your food being cooked right in the center of our restaurant. There isn’t a single bad seat in the house! We look forward to seeing you for all of your occasions soon!